E is for Explore! : Can You Help Me Find My Missing Piece? Can You Help Me Find My Missing Piece? 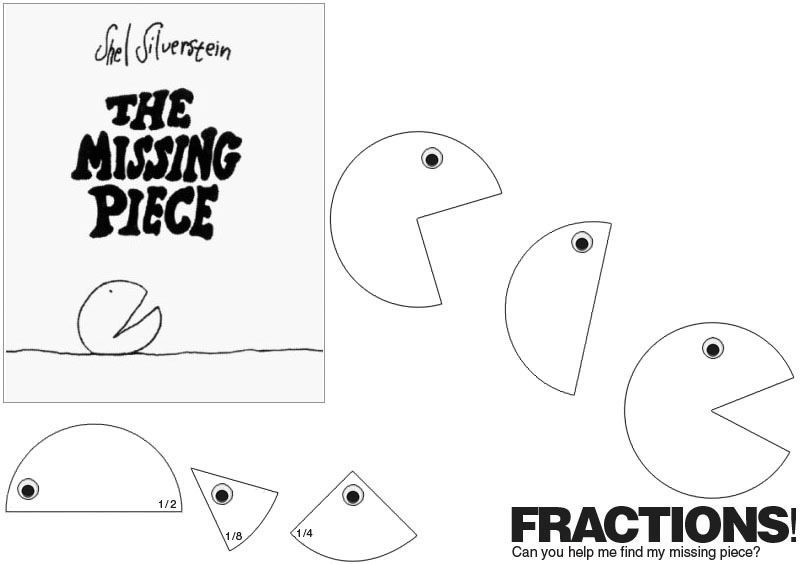 After reading Shel Silverstein's "The Missing Piece," have kids go on a fraction scavenger hunt! Cut out a fraction of a bunch of circles (enough for half of the class) and add a googly eye or make a black dot to represent an eye. Write the fraction on each missing piece and add an eye. Give half of the class a circle that is "looking for its missing piece." Give the other half a missing piece. Kids have to work together to find their match and figure out the fraction of the circle that was missing! Can they do it?! Note: For older kids, don't write the fraction on the missing piece. See if they can figure it out, using a ruler or by folding their circle!